The similarities are uncanny. The balletic elegance, the dazzling dribbles that begin with a drop of a shoulder and leave the opponents mesmerised; the impudent disregard of the opponent with the ball at the feet and the cool composure in front of goal. Samir Nasri evoked memories of Zinedine Zidane with his two goal salvo against Fulham on Saturday, yet, comparisons between the two feel somewhat like they shouldn’t be entertained. The Arsenal midfielder is it doing from the flanks. Which is, of course, where Zidane played towards the end of his career at Real Madrid but not after he redefined the role of the playmaker. Samir Nasri looks at home here. When he signed from Marseille in 2008, Nasri showed flashes but for every dazzle, there was deceit and he looked like a frustrated playmaker shunted further away from play. But for creative schemers like Luis Figo, he has found the wings allow space to wreak havoc and when he cuts inside, as he did for both of his goals, the opposition defence is found wanting. Arsene Wenger has been patiently waiting for Nasri to bloom into fruition and and one can see why as it’s easy to see how he perfectly fits into Arsenal’s system. It’s a dual role he has (which we identified last season that Arsenal needs to improve on), half as a playmaker and half as a winger, which he fully understands now. “We scored two exceptional goals from Samir that were a combination of touch, intelligence, special talent and calmness. He needed to be patient to finish in both situations and he did very well. I’m happy because he had a game that at the start was only based on coming to the ball and now he has more variation in his game. His game is improving and of course he is more efficient. Nasri’s two goals evoked “memories of Best”, was the Guardian’s headline but it came with a caveat as the “defence is laid bare”, it continued. Arsenal simply tore apart Fulham in the first 20 minutes but the Cottagers gradually came into the match with each chance Arsenal failed to put away. Much of the Gunners dominance in the first quarter of the match, lay in the way the front four performed. Andrey Arshavin, Tomas Rosicky and Marouanne Chamakh looked lively every time the ball went forward (although in the case of Chamakh, the ball spent too much time going backwards as he passed up one too many shooting opportunities to tee-up someone else) but they were also impressive as a form of defence. The quartet hardly allowed Fulham time and space to pass the ball out and that was typified by the first goal. The midfield forced a pass back which was miscontrolled by Aaron Hughes allowing Arshavin to pounce on the loose ball. His pass found the penetrative run of Nasri and he rounded two players with such impudent ease before smashing Arsenal into the lead. Nasri’s second goal was just as good and he had time pirouette on to his right foot to give Arsenal the three points. That was of course before Diomansky Kamara had equalised and Fulham gave Arsenal quite a scare. The bookmakers and critics alike see Arsenal as third favourites because of a certain fallibility they have in defence. Fulham’s goal could certainly be classed as unlucky as Laurent Koscielny became dazed when he collided with Sebastien Squilacci but the Emirates crowd could sense an equaiser coming. Kamara had already tested the offside trap on a couple of occasions and the law averages said he would do again if things remained like it did. And he did, although that after he had scored, as Fabianski did well to deny the striker one-on-one just before the break. The high line, which has not been as high as in previous seasons, was forced to push up as the central defenders sought to compromise for the space conceded in front. 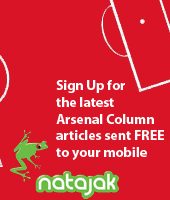 A compromise which, judging by his recent quotes; Arsene Wenger is fully aware of. “The teams close us down so much high up because they know we play through the middle,” said the manager. “I push my midfielders a bit up at the start to give us more room to build up the game. When you come to the ball we are always under pressure, so Song is a bit naturally high up because I want him high up. <Figure 1> Arsenal press Fulham. The front four’s marking duties are displayed as Hughes has the ball in defence. Rosicky acts as the second forward while Wilshere and Song back up the quartet’s closing down. As shown by figure 1 Arsenal looked to press high up the pitch. It is perhaps, less intense than last season, only due to the fact it has now become more strategic. Last season, it often felt like a flurry of red and white shirts at the man in possession. Now, as the front four press, each with a duty to man mark – not tightly but in close proximity to one of the back four – Jack Wilshere and Song, back up by getting tight to eliminate the next nearest passing options – the two holders. This worked well in the first few minutes but even if pressing is hard to maintain for the whole ninety – strategic defending aims to soften the intensity required – Premier League opponents often find a way to escape by playing directly. Suddenly the tables were turned and Fulham pressed higher up the pitch, but they also gave Arsenal problems because they aimed the ball quicker to Kamara while midfield runners looked to support him. If the front four press it places huge demands on the two holders. That means they must cover the space around them and with Arsenal’s emphasis on squeezing the space high up, that means a compromise behind. A long ball from the defence (figure 2) can expose this space and getting back means a great deal of intensity needs to be exerted by Song and Wilshere. As a result, the game lost its structure somewhat and the second-half became end-to-end. <Figure 2>How the pressing affects the unit. 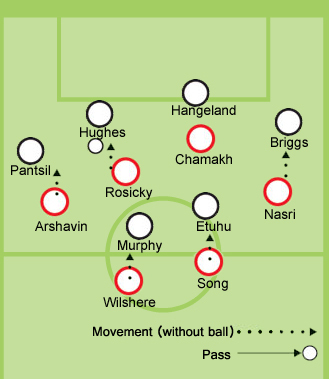 As Arsenal press, gaps enlargen behind which Fulham looked to take advantage of as they became more direct in the second-half. Arsene Wenger feels if Arsenal can score more, those structural inefficiencies can be offset. However, that is surely fanciful. It remains to be seen if it’s a peccadillo that can be bettered as the season wears on but at the moment, it’s more like a scab which, if the opposition can pick upon it, will always leave Arsenal vulnerable.